The picture shown is just a small portion of some of the more common styles of pallet racking out there. 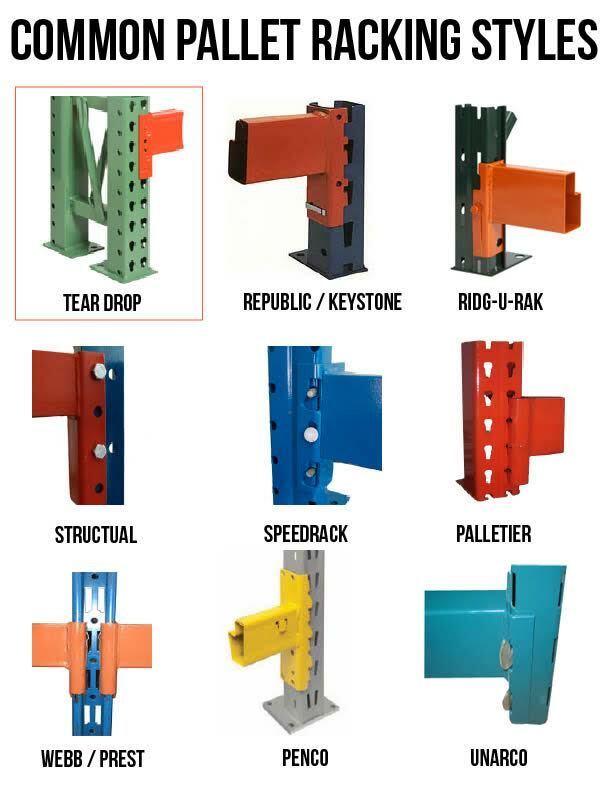 Because Tear Drop is recognized as the industry standard, we only sell new and used Tear Drop uprights and cross beams unless otherwise advertised on our specials page. Many of our customers looking for other style racking will switch to Tear Drop, either by adding Tear Drop in a new location or matching existing upright height and width and bolting the same size Tear Drop upright to their existing system - to continue the shelving run. All new and used products listed on our site are in stock & ready to ship. Items not shown can be quoted & delivered via quick ship from our manufacturer. We look forward to quoting your project!